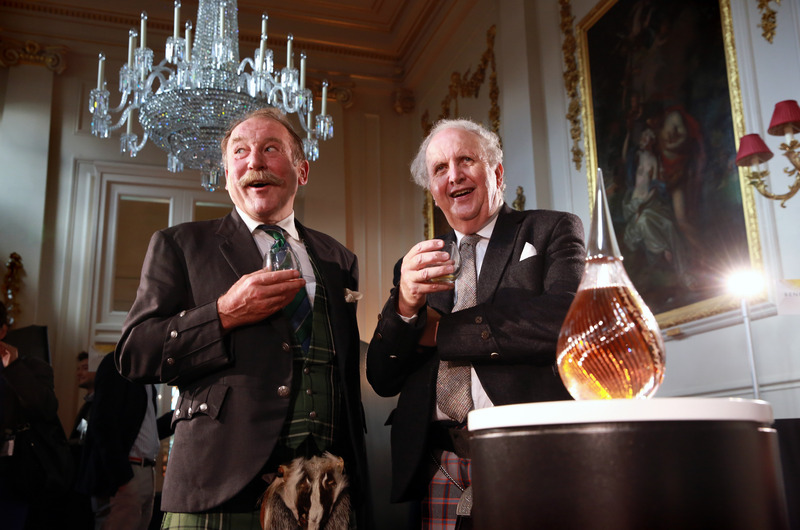 Whisky specialist Gordon & MacPhail raised the curtain on Wednesday 2 September 2015, at The Royal Opera House, Covent Garden, London, on what it believes to be the world’s most exclusive single malt Scotch whisky. “Gordon & MacPhail is one of the few, if not the only company in the world who could have produced this rarest of whiskies. Generations of the Urquhart family have taken a long term view to maturing Scotch whisky, guided by a simple family saying – The future is shaped by what we do today. Today reveals what we did in the past. This philosophy has enabled the current generation to unveil this exquisite whisky,” he added. The decanter is packaged in a luxury Aniline leather travel bag and accompanied by a specially commissioned book,Seven Nights with Mortlach. Acclaimed whisky writer, Charles Maclean and international bestselling author, Alexander McCall Smith have joined forces to tell tales of Scotland, whisky and the people behind this special malt, accompanied by illustrations from up and coming Scottish artists. The RRP of Generations Mortlach 75 Years Old by Gordon & MacPhail is £20,000, although prices may differ in international markets due to local taxes and duty. Appearance: Mid-amber, with rubious lights. Aroma (Nat. Str. ): Fresh and clean; very slight nose prickle: still lively. A highly perfumed, floral top note – lily of the valley, barber’s shop, scented hand cream, soft leather lady’s dress handbag – with a fruity complex in the middle (dried figs, pomegranate, ripe pear. Peach juice); creamy vanilla (Crème Anglaise), even vanilla fudge, and a faint trace of coffee in the background. Aroma (@30% Vol): Water reduces the floral notes with scented oil (bath oil? Teak oil? ), increases the soft leather note and dries out the aroma somewhat (warm sanded hardwood). Taste (Nat. Str. ): Sweet to start, but not as sweet as expected; considerable fresh acidity and slightly mouth drying. Bitter almonds. A most unusual trace of hemp ropes and very faded creosote, lending a slight smokiness. A medium-length finish, leaving an attractive aftertaste of sandalwood. Taste (@30% Vol): Lightly sweet; slightly oily texture; mouth drying; then slightly bitter finish. Some spice across the tongue. Warming, even at this lower strength. Comment: A most unusual taste – never before encountered. Smooth and highly sophisticated – elegant as a grande dame – the Ingrid Bergman of malts! 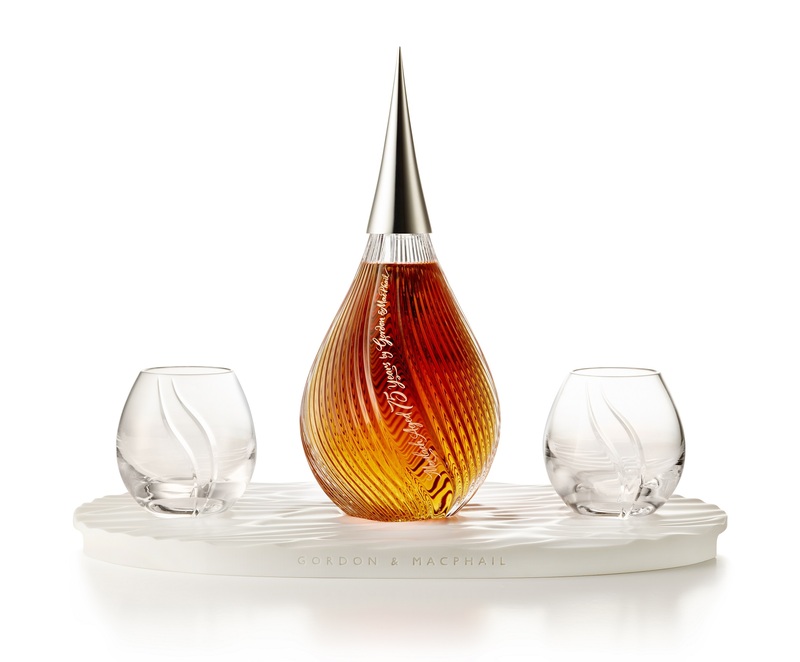 Generations Mortlach 75 Years Old by Gordon & MacPhail is beautifully presented in the iconic teardrop-shaped Generations decanter. Each of the 100 decanters released worldwide is uniquely numbered and skilfully handcrafted with 75 multi-level “cuts”; each cut representing a year of the whisky’s maturation. The decanter nestles on an elegant white presentation plinth, delicately sculpted with ripples to resemble the movement of the water used to create this whisky in 1939. 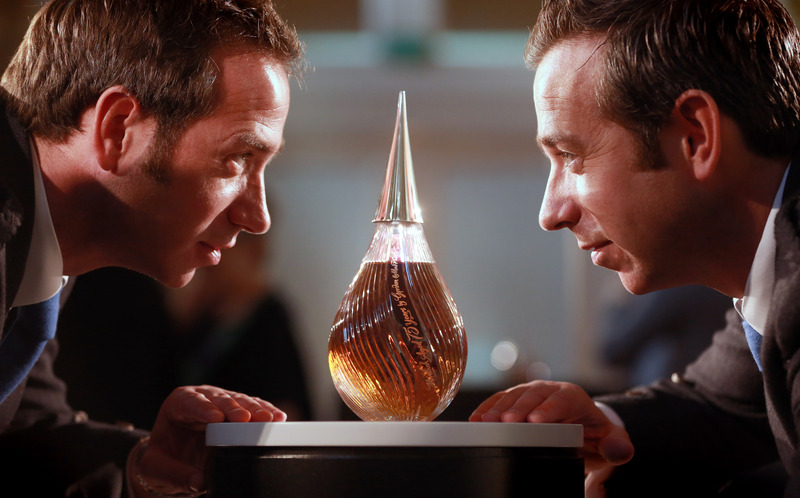 Two crystal glasses, uniquely designed for the enjoyment of this exclusive Single Malt, sit either side of the decanter. Accompanying the presentation is a book written by acclaimed whisky writer, Charles Maclean and international bestselling author, Alexander McCall Smith. In “Seven Nights with Mortlach” the authors relate tales of Scotland, Scotch Whisky and the people behind the Single Malt. Seven beautiful poems, written by McCall Smith, accompany the narrative. The poems are accompanied by illustrations commissioned for the book by emerging Scottish based artists. Completing the presentation is a luxury travel holdall. Handmade using the finest Aniline leather, the holdall is finished with exquisite detailing.